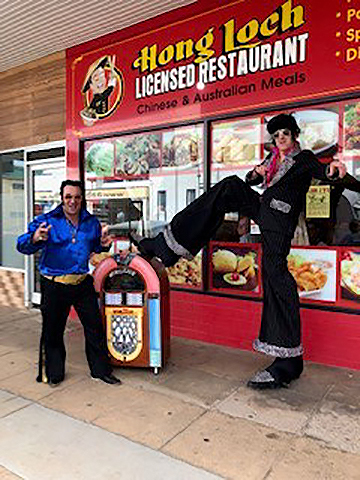 IT was only 2018 when Joe and Leisa Ozzimo came to PARKES for the first time last year. A “huge Elvis fan” and a singer, Joe had always been keen to check out the festival. “We decided to come back this year and get right into the spirit of the event with me busking and entering the senior tribute contest,” said Joe. “My wife went all out with her costumes. On arrival we saw that other buskers were getting tips and selling CDs and we thought that we could do something charitable. “We asked Ken McGrath if we could make a donation of any money earned and he let us know about the local Currajong Disability Services and that made perfect sense to us,” said Joe. Having worked in the medical device industry and having some knowledge of the NDIS, Joe and Leisa have been exposed to the plight of many people less fortunate than them and wanted to help where and where they could. “With my singing particularly, I have supported charities such as White Ribbon, the CFA in Victoria and soon to support a beyond Blue event,” said Joe. “It allows me to do what I am passionate about and hopefully provide some support to those less fortunate any small way we can. From everyone at Currajong, thank you!